Appearance : Clear yellow coloured liquid. pH of 10% solution : 7.5 _+ 1. Active Matter : 60% _+ 1. Stability : Stable to electrolytes in usual concentrations. Emulsion stability is excellent even in hard water. Compatibility : Compatible with anionic dyes, fatliquors as well as synthetic and vegetable tanning agents. Dissolution . Easily emulsifiable in hot or cold water. Fastness to Light : Good. 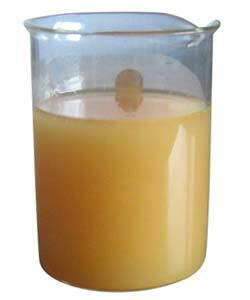 Popsynth 1104NQ is highly penetrative fatliquor which imparts excellent softness to leather. It also provides pleasant handle and smoothness to the leather surface. . Popsynth 1104NQ imparts required degree of softness and fullness without making the grain loose. Popsynth 1104NQ is designed specially for the sophisticated class of leather which require soft feel with light weight. Popsynth 1104NQ is suitable for all types of leather, specially to make softy upper, lining, D.D. without looseness. Popsynth 1104NQ is specially suitable for nubuck, garment, nappa, drymill, upholstery, etc. as it gives excellent softness with light weight. Popsynth 1104NQ can be stored for about one year under normal conditions and temperatures.